It flowers from June to September. It produces very large purple fruits in the Fall. Passiflora edulis purple giant can reach 10 meters high. It climbs by means of clinging tendrils and can be kept as an container plant. The long tendrils need lots of support for climbing. It may be grown as a houseplant in a sunny South-facing window. Very fast growing handsome vines with glossy three lobed, deep green leaves and flowers with a white and purple crown. It flowers from June to September. It produces very large purple fruits in the Fall. Pruning is a must to keep the vine healthy. Prune off less vigorous growth and occasionally prune back vigorous growth to promote flowering. 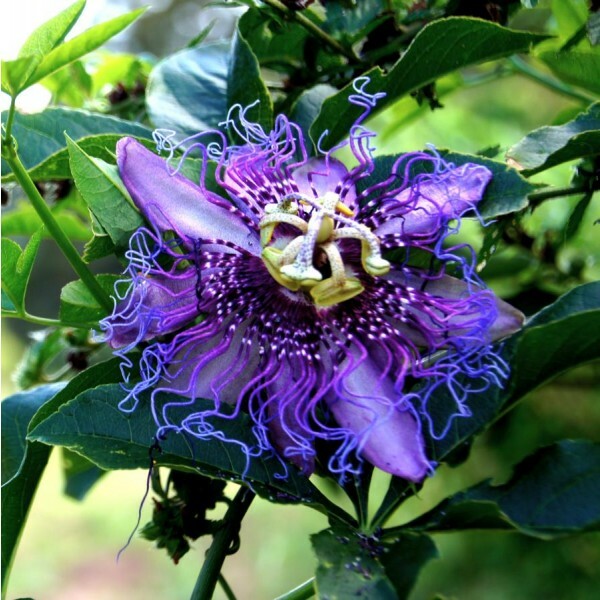 When established, and without care, the passion fruit can easily overtake other garden plants, shading them from sun. Hardiness zone 10, (1°C/35°F) in Winter. Protect from frost or plant in frost free areas. This Passiflora is hardy to 35°F when mature, frost tender when young. Provide ideally a temperature of 15°- 28°C in Summer and 7°C through the Winter. Keep the atmosphere humid through the Summer and place in full sun, can tolerate partial shade. Passiflora Edulis Purple Giant loves the warm humid Tropics. You may need to water your plants on a daily basis during the hottest Summer months. During the Winter the roots should be kept moist, but as growth will be much slower you will probably only need to water once a week, depending on growing temperature. It will do best in a loam based mix with a little peat moss. Fertilize at least once every two weeks in the growing season. If their pot is too large or if they have an unrestricted root run then the whole plant will simply get bigger and bigger but it will refuse to flower and therefore produce the fruits. By limiting the pot size you are limiting the ability to grow and this is seen as a threat, so the natural mechanism is to produce seed for the next generation. A suitably sized pot for an adult plant would generally be of 12 inches in diameter.